More than just a pretty bottle. Joe Farrell owns The Landing Guest House on Harbor Island, Bahamas. He started having a private label wine made for his little business with a modern designed logo of a beautiful Bahamian woman’s face and detailed headdress. In 2008 he started bottling his own Rum blend to serve his guests as well. Soon, guest house visitors were requesting shipments of “that Rum with the Afro Head” to be shipped back home. Thus, a new business venture was born. It is available in both 7 and 15 year versions. 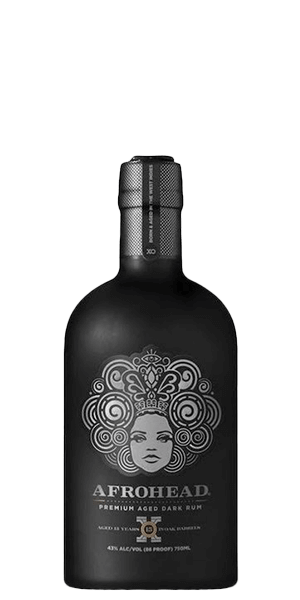 Afrohead XO 15 Year Old Premium Aged Dark Rum is based on cane molasses from the Dominican Republic and is fermented with a unique strain of yeast that is only used in Trinidad. It’s this yeast that lends a “toffee & banana” essence and we think that’s a pretty tasty thing indeed. Distillation is performed to taste — as it should be — up to 5 times. Most Rums are only distilled 2 or 3 times. Ageing takes place in first fill ex-Bourbon casks. It’s no wonder all those hotel guests were clamoring for more. What does Afrohead XO 15 Year Old Rum taste like? The Flavor Spiral™ shows the most common flavors that you'll taste in Afrohead XO 15 Year Old Rum and gives you a chance to have a taste of it before actually tasting it. Mango, tobacco, spice, and leather. Crisp with sweet banana and rich toffee, but plenty of heat. Very long, spiced toffee and espresso. Smooth like rum too much spice in the aftertaste for me. It is a very good, intense, Dark Rum with a complex birth; while a crisp & warming life; that leads to a very long death with notes of lime, ginger, spiced toffee & espresso. Great overall rum, not overwhelming in any area. Very well-balanced and a solid sipping choice. Good price point to introduce someone to sipping rums. Pretty good. A little over-leathery and some spice and smoke that overpowers the aftertaste. Still, a pretty good sipper. Rocks made it open up a bit but also made it a little too shallow. Did get rid of the overpowering spice and leather notes though. I never thought I would ever have a "sipping rum", but this changed my mind. Easy sipping like a good Scotch. Very good. This is how rum is supposed to taste. Smooth and easy to drink with hints of wooden barrels. Sweet but not too sweet and no bad after taste like you get with cheaper bottles. Aged is the way to go and this is my new go to rum! The taste of the rum was nice to my palette. Alcohol was to harsh for my taste. Very interesting. Not qite as dry as a scotch, but moving in that direction. I will get more in the future. Probably the best tipple to touch my toungue was XO I’m sure they have made the best Rum on the planet. strong to start but gets more complex and flavorful over time. The finish is amazing. A really good depth in flavor, a burn to start but goes down real smooth. Definitely get a the caramel and banana with a hint of mango but not sweet. Would pair really good with ginger ale. I'm not a traditional Rum connoisseur, so my palate may be different from the, so called experts. However, I do love a great Bourbon and Afrohead XO 15 year rum give me notes of vanilla, caramel, and sugar cane that out of this world. I like to follow each swallow with a small sip of water, which totally brings out the flavor notes is the remarkable distilled spirit. The fact that it's aged in Jack Daniels barrels is evident and highly appreciate. This has become one of my all time favorite drinks...neat and never mixed. I'm such a huge fan, that the regulars in my cigar lounge call me the un-official spokes person for Afrohead, what a huge compliment. Not much flavor - smooth but lacking in depth. Undrinkable, nose wasn't unpleasant definitely could smell tropical fruits but seems more like a cover up. This rum tastes like chemical candy. Smooth and satisfying. Small bite to it. This rum is for the smooth in you I enjoyed this with a nice cigar and some jazz music in the background. It’s not overly sweet but has just the right amount of kick at the end. I will be buying more. Great long finish with a bit of a cognac taste. This rum doesn't linger either. Well done. Not as heavy as expected, but hints of very complex flavors. Would not hesitate to mix. Will try again after a little time. Beautiful robust flavor with mossy oak/peat undertones.. Sweet & heady upfront with caramel/toffee undertones & a Very smokey finish. Very good, but I Prefer the Afrohead 7 year personally. Think the aged flavor here is a bit too much. Like Laphroaig, (one of my hubby's favorites) kind of a kick in the teeth. My wife and I absolutely love this Rum, it is amazingly smooth without that super strong after taste that leaves you wanting a chaser! !